Hello everyone and Happy First of April! 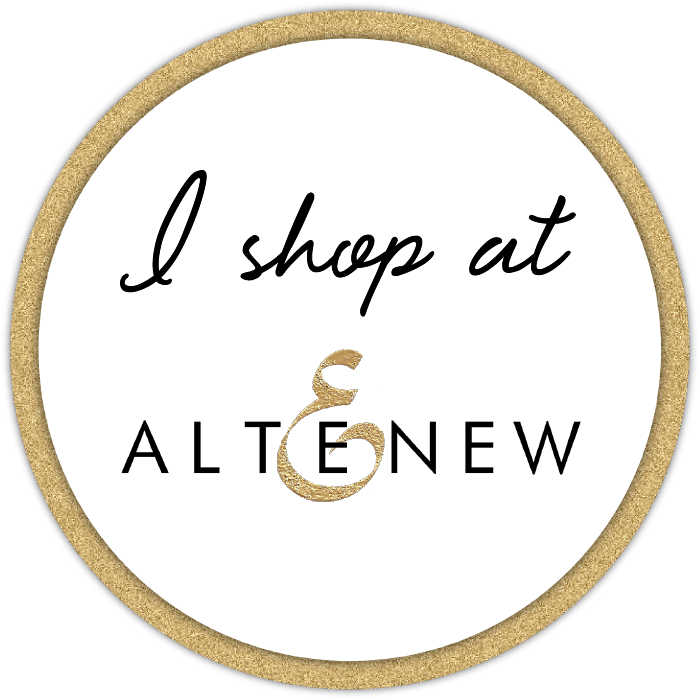 Feeling honored to be on the BlogHop list sharing the new Release from Altenew! 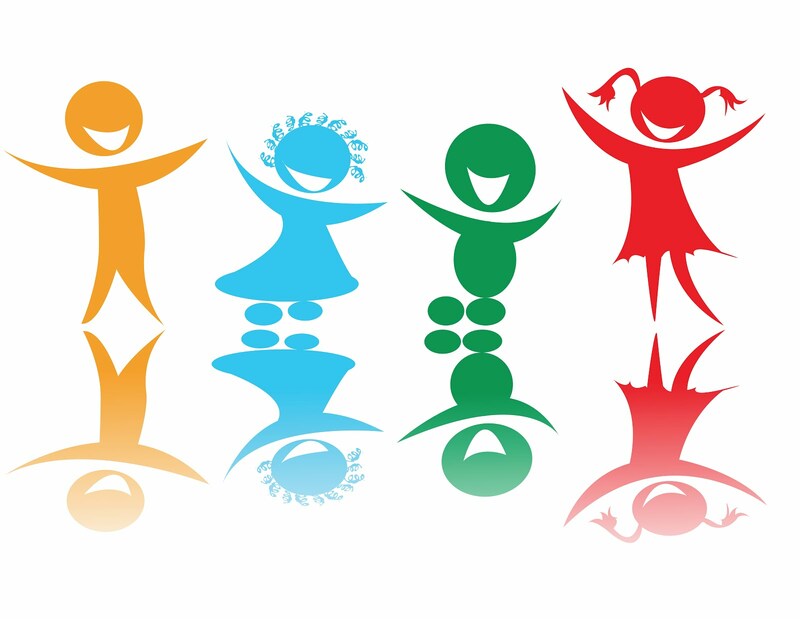 If you are hopping along from the beginning of the, you should be arriving from the blog of Svitlana Shayevich. 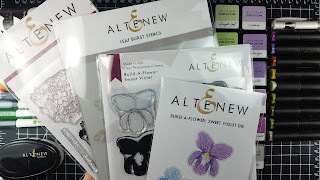 On the back of the packaging there is a layering guide for ease of stamping all the layers. 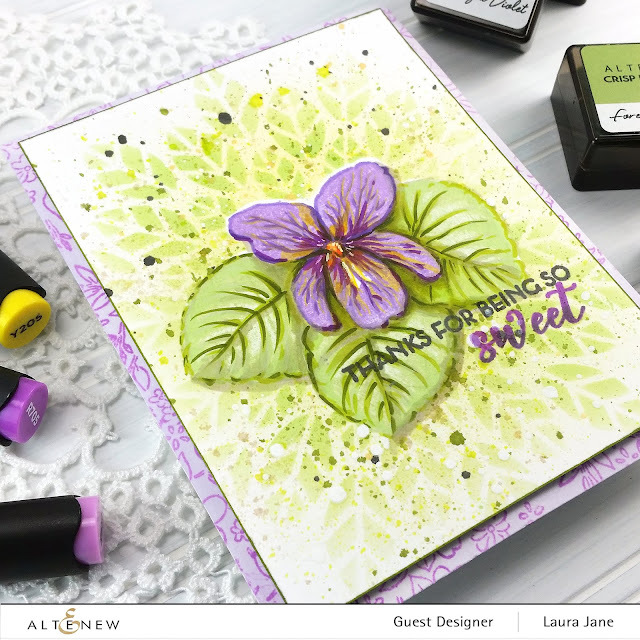 For my first card, I stamped the outline layers of both SWEET VIOLET blooms and the leaf image with Silver Lake Crisp Ink onto watercolor cardstock. Then colored with the the Watercolor Brush Markers, and Artist Markers. The Dies in the set make cutting out a snap! Then I created a spring Posie layered into a freestyle collage of hearts, lace border and washi tape. I love how the Dots in Maple Washi Tape coordinates with the yellow paper from the Celebrations 6x6 Paper Pack for my sentiment banner! The word lovely is fussy cut out to add interest. I created several frames with the Halftone Hearts Nesting Die Set by placing two dies together and cutting at teh same time. The Floral Heart Frame Die is snuggled in the center, and I gently folded a few of the Floral Heart Frame branches up to pop out of the arrangement. The Build-A-Flower: Sweet Violet can be purchased as a Bundle with 8 inks. 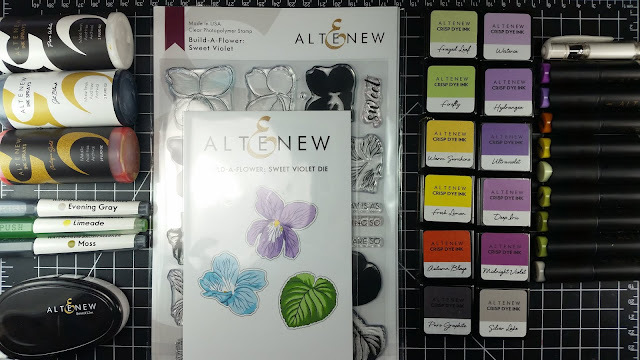 My next card is a mixed media almost One Layer card featuring the Build-A-Flower: Sweet Violet. I turned the camera on to capture the process start to finish:) This was so fun to create! Watch the process below or on my YouTube channel in HD by clicking here.. If you have any questions about my cards please ask in the comment section below. 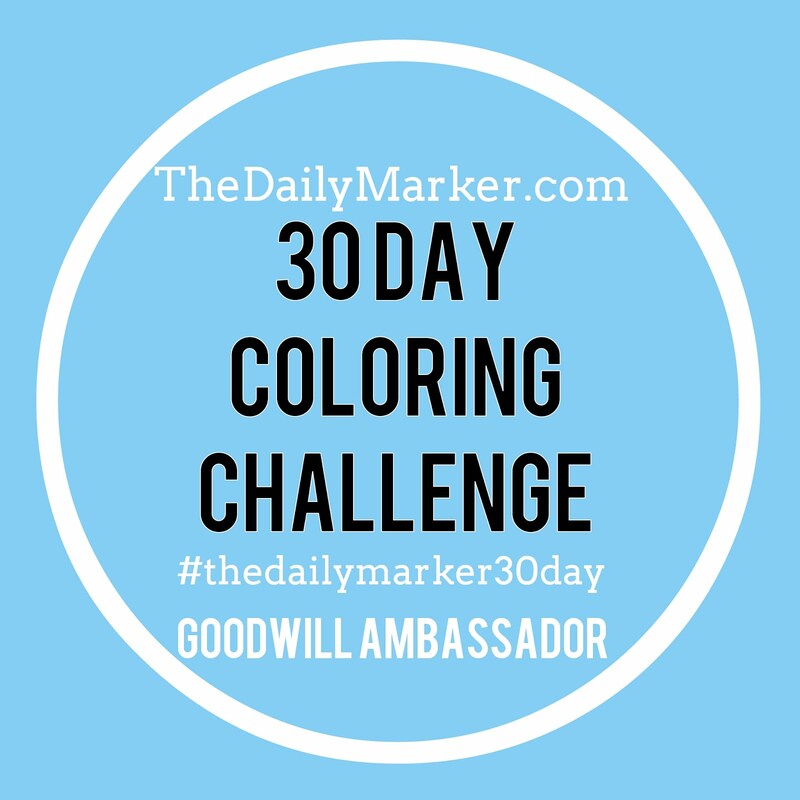 Don't forget to leave comments along the way for chances to win! Eh gah,woman! I LOVE violets and your cards are perfection. I am looking out at snow and your violets speak to my 'longing for spring' heart! Wow! Both cards are very pretty. Your "almost " one layer card is magnificent. Thanks for the video-- I love to watch you create. stunning cards - love the artistic splatters!! Terrific cards! 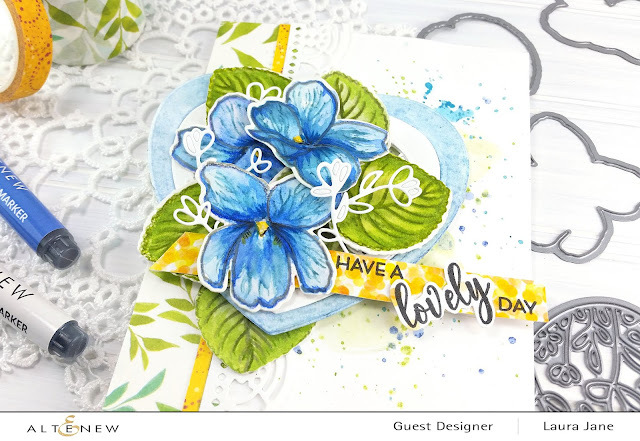 I really like all the lovely layers in your first card... so pretty! The sweet little violet in yout-r video is the one I prefer, so adorable. 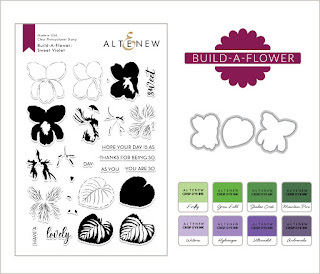 the stenciled background is a brilliant way of accenting your gorgeous violet bouquet! Beautiful! Before I even read your blog, I thought it looked like a princess ie!, the lacy leaves look great with it. And it is amazing that the Sweet Violet can stand alone.......with the textured background. Love all of the great textures on the first card. Love how you created dimension with the markers on the second card. Lovely cards. 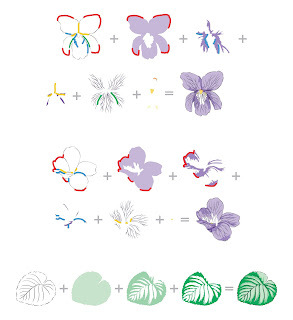 I really love the card with the single violet. So pretty! It's always a delight to see what you have done with the newly released sets. Both cards are so sweet-make me smile! Beautiful cards! I love your card designs and colors. Beautiful! Love both of your cards. The violets look great together and alone. Great job showcasing that idea!! I like your cards. You put a lot of creativity in them. Both of your cards are beautiful. Your first card reminds me of a tea party and your second one makes me think of the violets I have growing in my yard. Thanks for sharing your talent! Great cards! Love the colors you chose! Thanks for sharing these lovely cards Laura! Boy so much detail. A beautiful card and you did a lovely job of shading too. Lovely. You are AMAZING! I know that you will always create something that is so unique and so gorgeous! I love the dimension! Lovely examples! Absolutely stunning! I can't wait to play with the splashes of color, like you've added to these. Tricia Podmore here, your creativity is awesome along with your detailing. Absolutely finds your cards striking. Thank you for your video as it is always so helpful. Beautiful cards and such great detail! Beautiful cards, LOVE your designs and the washi tape sentiment banner is brilliant! Your watercoloring skills are just gorgeous! I must give this a try. MMM, beautiful!! Lovely cards! 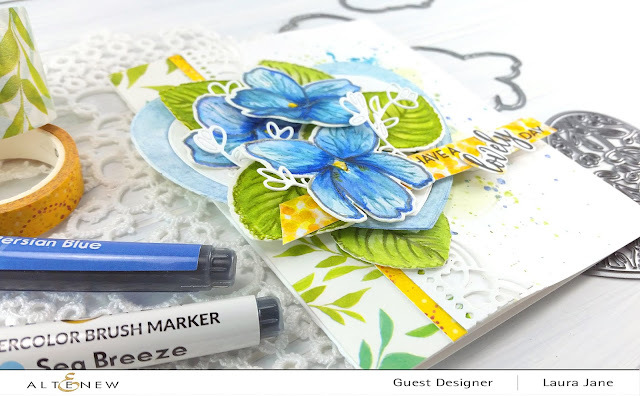 I especially love the use of die cuts to embellish your first card! Pretty layering and dimension! 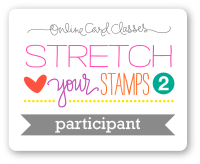 Gorgeous coloring on your beautiful cards! Really beautiful! I especially loved the splatters and stencil background. Thanks for the process video. Wow, your cards are fantastic! Lovely designs Laura Jane. Love the watercolor marker colors you chose, great job coloring the pretty flowers. This BAF set is a must have, thanks for the inspiration and video . Fabulous cards and video! Violets are one of my favorite flowers and I love how you captured their sweet look. Such beautiful cards, Laura! I especially like how you surrounded the lovely violets on the first card with the hearts and the leaf washi is perfect to accent them! Thanks for some amazing ideas today! 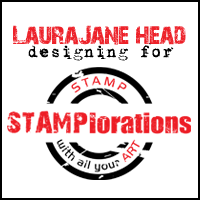 Laura Jane, I love your designs. What pretty backgrounds and lovely layers you have created! 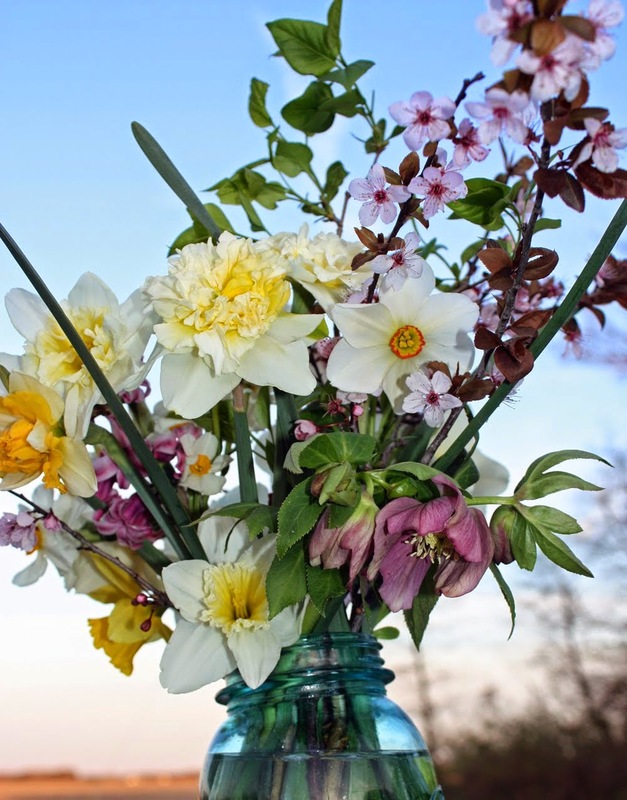 Love the colors of the blooms, lovely work! Thanks for sharing! Such a beautiful use of this awesome set. 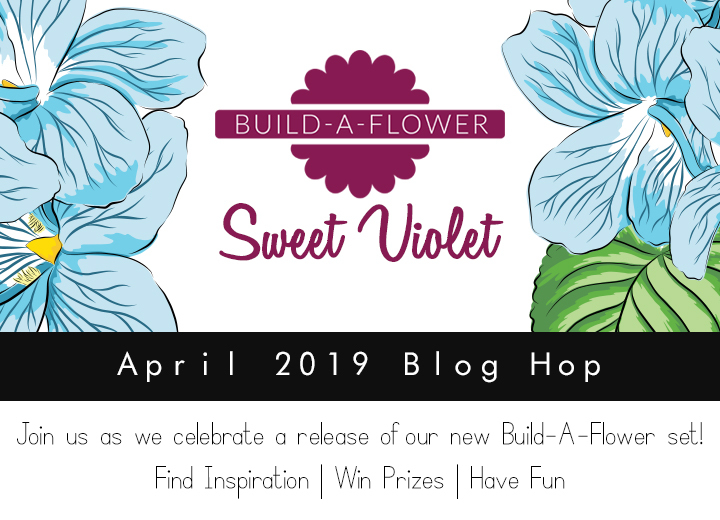 Glad to have found you on this blog hop. Love your style. Will be tuning in to see more of your beautiful work. 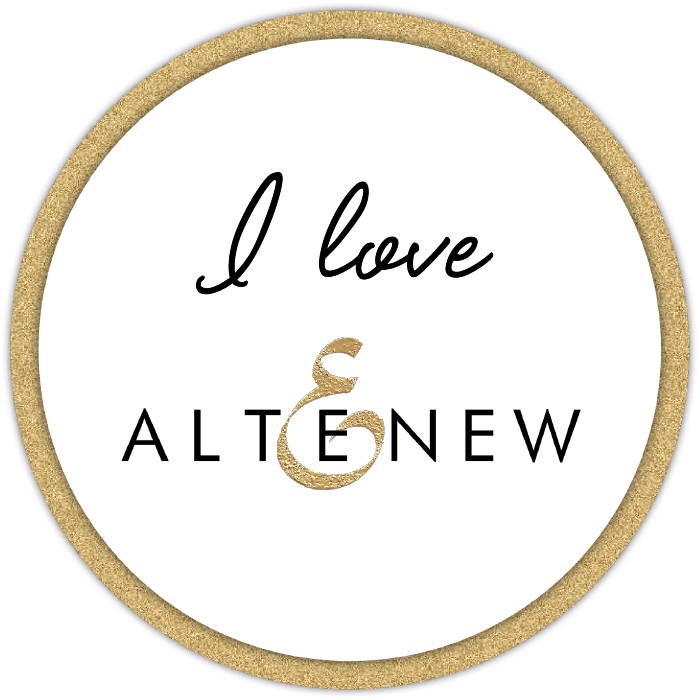 Happy 5th Anniversary Atlenew! 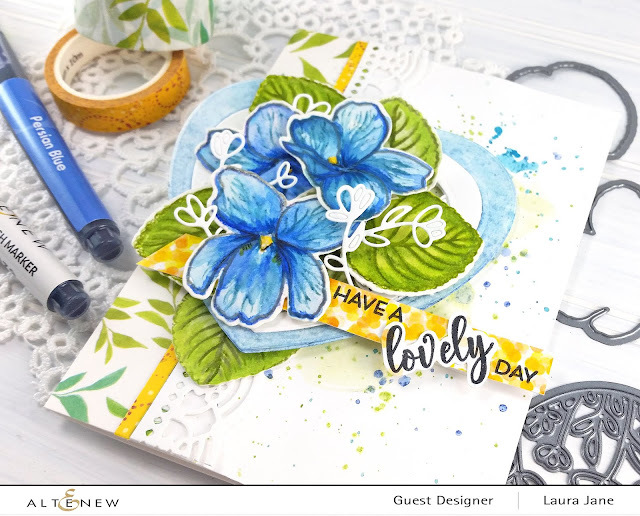 Beautiful cards, Laura Jane! Both so different but so striking! Thanks so much for sharing and for your wonderful inspiration! Both the cards are beautiful! Love the colours you have used. The new BAF set is really fantastic. 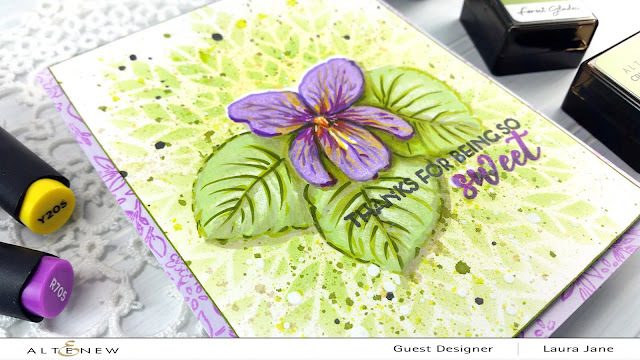 Beautiful cards - I love the various layers you used on the first one, including the bits of contrasting white, and love the stenciled background on the second, it makes a lovely explosion of pattern and colour behind the violets. Great cards. I especially loved your arrangement and placement of flowers and elements in the first card. It really is beautiful. Those flowers make a great bouquet. Thanks for the inspiration! Gorgeous cards. 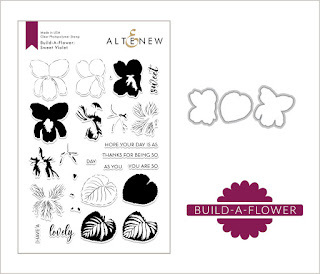 I love this stamp set and you've showcased it beautifully. Very pretty. I like the layers on the first one. Your cards are gorgeous as usual. Very beautiful flowers!! Your cards are beautiful! I wish there was a video of the first card also. I like all the layers on it and would have loved seeing it come together. Thanks so much for the video of the other card. I really enjoyed watching the background come together. You have a lot more patience than I do when it comes to coloring. Did it take as long as it seemed to color that flower and leaves? It looks great but I'm not sure I could do that. Great job! Amazing cards! I love them!